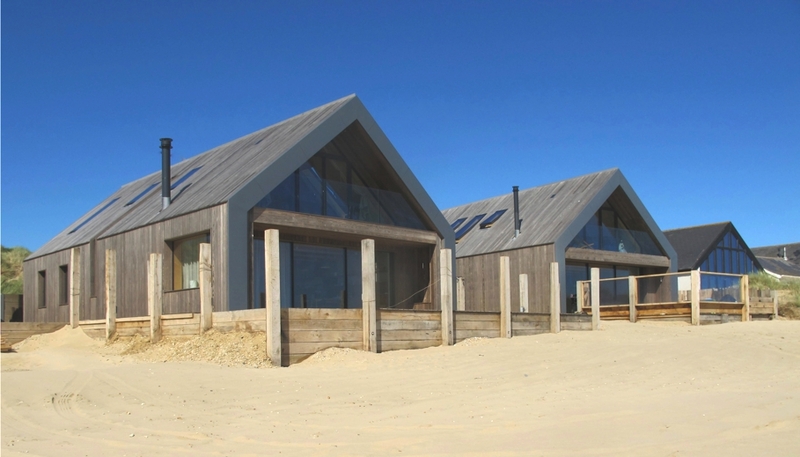 Two contemporary beach houses, with floating foundations, stainless steel frames and Kebony wood cladding have been unveiled at Camber Sands in East Sussex, England. Situated next to the county’s only sand dunes, the four-bedroom luxury abodes are the ideal summer bolthole with spectacular views of the sea and unparalleled access to the beach. 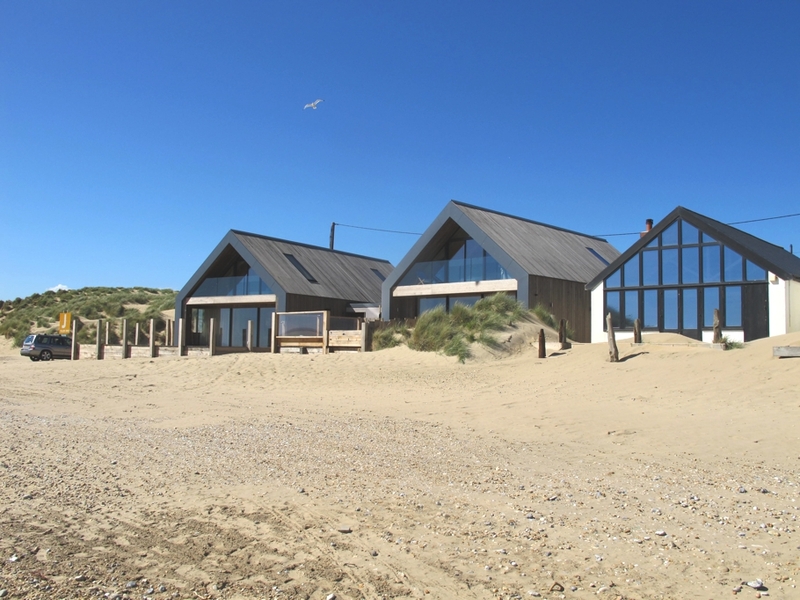 Architects Walker and Martin were commissioned by a private client to build two beach houses right on the seafront on the site of an old bungalow positioned in front of the sand dunes. 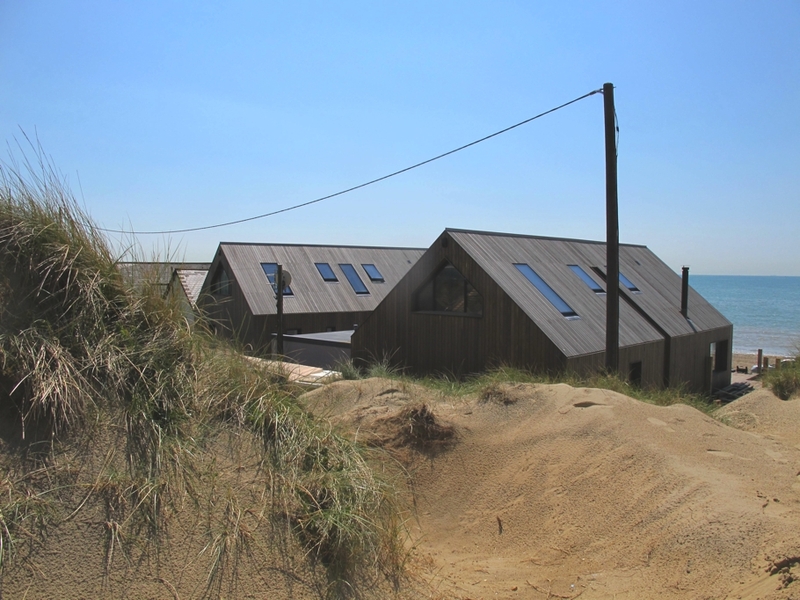 Just metres from the beach, the houses are in fact almost embedded into the dunes. 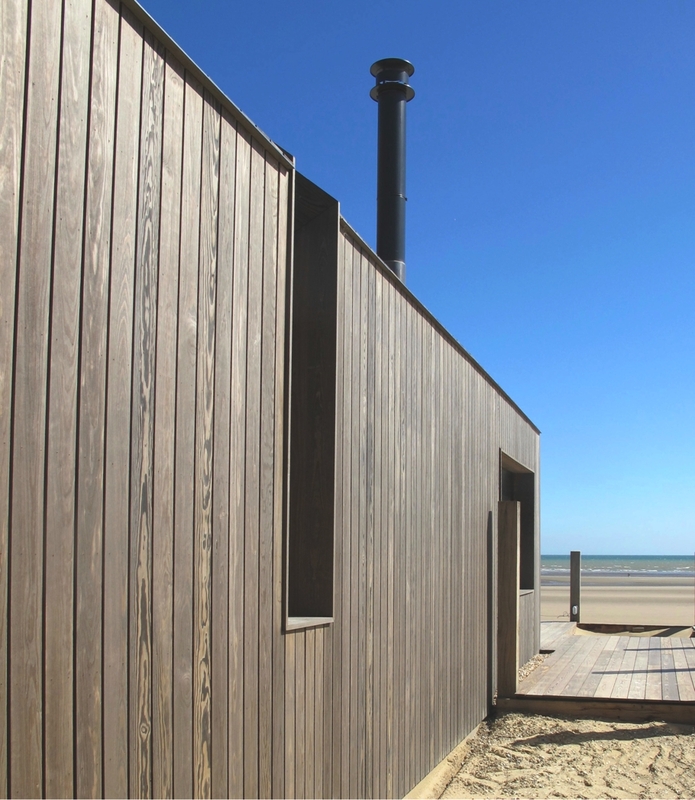 The material selected for this ambitious project had to be durable and visually complementary to its seaside location. The architect wanted to create a seamless continuity in the building’s structure, to echo the natural smoothness of the dunes, and the interior’s wooden beams accordingly have an uninterrupted appearance, regardless of vantage point. 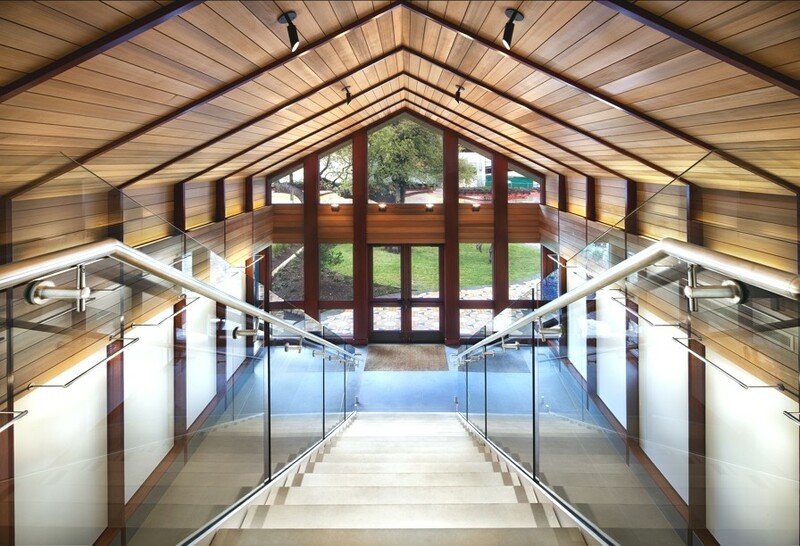 The building was designed to have minimum impact on the environment and recycled and sustainable materials were used throughout. The structural challenges of the location became apparent during the construction phase and were a good indicator of the forces that the buildings will be exposed to in their future. Without roads, the constructors had to make makeshift pathways through the sand to transport the materials. 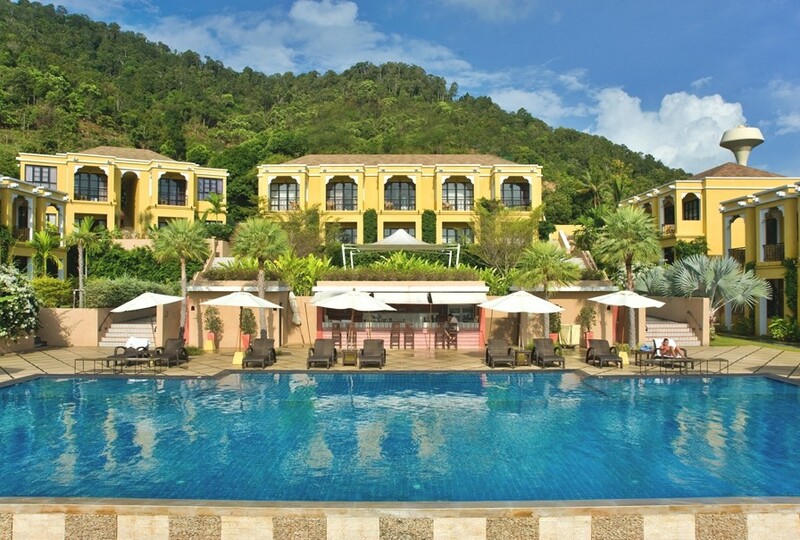 The site was battered by the severe storms and tidal surges that hit the country during the winter of 2013/14 and gales swept up the beach, blasting the building with sand as it began to take form. Consequently, the huts have been built with the requisite resilience and ability to fend off the elements in their exposed position on the coast, providing ample protection for their owners to enjoy the calm, warm summer days.